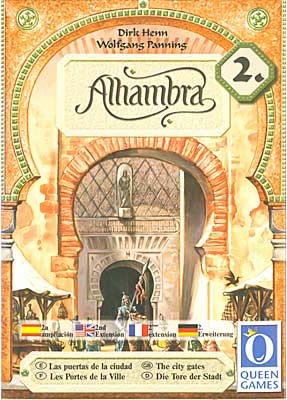 The Second Alhambra Expansion is called "Gates of the City"; like the first expansion, it offers 4 new ways to play Alhambra (as many or as few of the Expansions may be used or combined with each other). "Gates of the City" enables a player to build whilst ignoring the usual rules about building next to city walls. "Military Camp" allows players to score one additional point for every building that faces in the direction as the arrow. "The Characters" have special abilities, which the player assumes if he bids highest. "Diamonds" may be used as a sort of currency wild card, to represent any currency the player wishes.